Harshaali Malhotra is an Indian child actress and model who appears in Hindi-language films and television series. Malhotra made her film debut with a leading role in Kabir Khan's 2015 drama film Bajrangi Bhaijaan, opposite Salman Khan, Kareena Kapoor, and Nawazuddin Siddiqui. She played the role of Shahida also known as 'Munni', a Pakistani Muslim girl who gets lost in India and travels back to her homeland with the help of an Indian, Pavan Kumar Chaturvedi (played by Khan). Malhotra was selected out of 5,000 girls who appeared for the film's audition. Malhotra's performance as a mute girl was critically praised and earned her the Filmfare Award for Best Female Debut nomination, making her the youngest person to be nominated in the category and won the Screen Award for Best Child Artist among several other awards and nominations. ^ "Salman Khan's 'Bajrangi Bhaijaan': The making". ^ "Not Salman Khan, Harshali Malhotra is the real star of 'Bajrangi Bhaijaan': Kareena Kapoor". The Indian Express. 20 June 2015. ^ "All You Need To Know About The Little Girl Of Salman Khan's Bajrangi Bhaijaan". Businessofcinema.com. 13 June 2014. Retrieved 18 June 2015. ^ "Big Star Entertainment Awards 2015 winners list". bollywoodlife. Retrieved 14 December 2015. ^ "Arjun Rampal's new co-star is little Munni from 'Bajrangi Bhaijaan'". 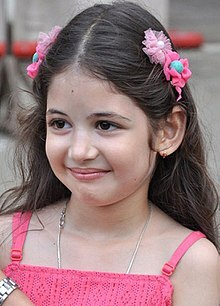 Wikimedia Commons has media related to Harshaali Malhotra. This page was last edited on 29 March 2019, at 07:22 (UTC).